Along the north eastern shores of False Creek, between Science World and BC Place, lies a vast expanse of land owned by developer Concord Pacific. The parcel of land hosts Concord Pacific’s sales centre and is used primarily as rental space for special events. Recently however, the lot has become host to an urban farm run by a group called SOLEfood. SOLEfood is a self-described “social enterprise” that grows produce in order to sell it at farmers markets, as well as directly to local restaurants. While initially funded by grants and donations, the project aims to be self-sustaining. While Concord Pacific is leasing the property to SOLEfood for three years at no cost, the farm is highly profitable for the developer. Under the City of Vancouver’s tax classifications, the property would normally be designated class six: “business or other,” with a taxation rate of 1.75 per cent. The presence of the urban farm re-designates the lot to class eight, or “recreation and non-profit,” which lowers the tax rate to 0.56 — less than a third of the original rate. Concord Pacific’s project map shows that the company intends to develop a number of sites on the lot, near where the Georgia Viaduct now sits, by 2020. The SOLE in SOLEfood stands for Sustainable, Organic, Local, and Ethical. With a three year lease on a lot intended to be developed in less than a decade, it would seem that sustainability is not its strongest feature. Concord pays around half a million dollars per year in taxes on the property, 10 Pacific Boulevard. In a recent interview with Zoe McKnight of the Vancouver Sun, the company estimated their savings via SOLEfood in the $15,000 range. However, if the new urban farm tax rate is applied to the entire property, Concord will pay only one-third of its taxes, saving instead over 300 thousand dollars per year. Concord’s Senior Vice-President of planning, Matt Meehan, was quoted in a Vancity press release saying that these property tax savings will go into a “foundation for future green projects and initiatives such as SOLEfood.” Similarly, in 1988 Concord committed to building a large park on it’s North False Creek lands. No park has been built to date. “We compliment the current property tax system that encourages landowners to allow these kinds of temporary urban farms, and we expect to see many more of them spring up all over the city,” Meehan also said. SOLEfood is not the first urban agriculture project on Concord’s property. 58 West Hastings is a highly contested piece of land a few blocks North of the False Creek site, across from Save-On-Meats. Owned by Concord Pacific and left empty for years, it was originally intended to be the site of the Greenwich condo development. In 2010, the property became the site of the Olympic Tent Village. As of May the property hosts the Hastings Urban Farm, a project run by the Portland Hotel Society. The proposed Greenwich condos for the property were opposed by community activists from the start. When asked about Greenwich, a Concord Pacific salesperson stated to The Mainlander that the project has been put on hold due to public opposition, but that online registration is still available and the project would possibly still go ahead at some point after next year. Concord also owns 117 East Hastings, next to InSite, which has been home to The Hastings Folk Garden since 2008. The 117 Hastings property is small, but since 2005, when the property was worth $400,000, its value has nearly quadrupled to $1,415,000. The urban farm could save Concord up to $17,000 in taxes per year, making it more affordable for the corporation to sit on the land and continue to speculate while the surrounding neighbourhood gentrifies. It was these two parcels of land that Concord Pacific offered the city in 2011. In exchange, Concord wanted the ability to ditch their social housing requirements on two of their False Creek properties. The city requires that 20 per cent of all new residential developments be designated for non-market housing, and this swap would have erased that commitment. The city has not accepted the offer as of now. However, the negotiations are further evidence of Concord’s savviness in circumventing taxes, fee requirements and other community contributions. 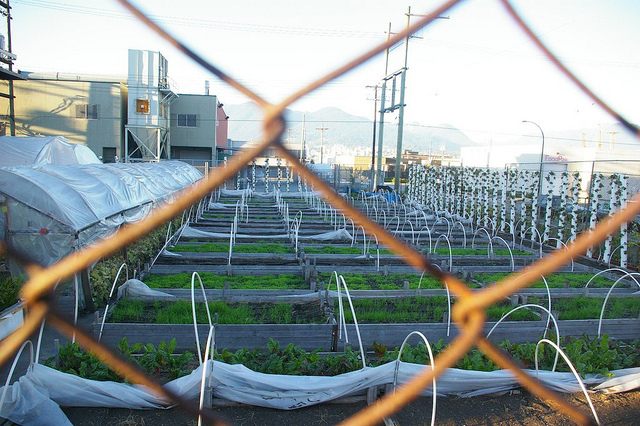 Concord Pacific has no incentive to rush development on its lots with urban farms. Minimal property taxes won’t put a dent in their profits, especially as they’ve found a convenient way to save money that also deflects public attention away from properties left empty — properties that continue to climb in value. Concord is not alone in using this strategy for real-estate speculation. Other developers such as Omni Developments and Prima Properties have also used urban agriculture to avoid paying taxes on their properties. Vancouver already has some of the lowest corporate taxes in the world. In combination with a competitive housing market, further tax breaks on land speculation only make matters worse by incentivizing coordinated upscaling, displacement, and property inflation. Urban agriculture projects are something that members of the community may benefit from, but most so if they are permanent additions to the neighbourhood and can provide true food sustainability — not temporary tools to help developers speculate on land. Posted in City Hall, Downtown Eastside, Gentrification, Housing. Bookmark the permalink. Properties that have climbed in value, yes, but now that the market is at long last turning it’ll be interesting to see what becomes of these fundamentally speculative landholdings. With the margins of profit these developers have been accruing it is too much to hope that they could go underwater on their “investments”, but at the very least they should no longer be incentivized to let them stagnate year after year as they watch their paper value balloon. Of course this may simply force their hand in ways we may disapprove of, but I wonder if your analysis would be at all changed if it were to consider the impact of a precipitous drop in real estate values. This has been an issue deserving attention for some time. Thank you for investigating. Just an FYI – SOLEFood’s beds at the Science Centre location have all been built using shipping pallets so that they can be moved to another location at the end of their lease. They have around 20 workers who live in the DTES and provide a lot of food in that area. But, yes, let’s complain about something that has been seen as resoundingly positive because a developer is making a (very) small profit after renting land tax-free. How much do the people working on the farms get paid? Where does the food that they grow go? Do they get to eat it? The employees are treated AMAZINGLY. The people that run it are incredibly flexible, supportive and really want everyone to succeed. The employees have a lot of input into the hours they work, when they might need breaks for mental health etc. I regularly eat the food that my friend brings home from work for a heavily discounted rate and it is amazing. They have stalls at most of the local farmers markets, sell to local business in the DTES and (as far as I know) donate food to other non-profits in the area. Most of the people working there are people who would not be working otherwise – it is a great opportunity for people to gain skills. So they make living wage? Actually, as far as I know, they make BELOW minimum wage. But that’s just what I heard and not a proven fact. CONCORD PACIFIC OWNS OVER 12 ACRES OF LAND AROUND FALSE CREEK, INCLUDING A 9.06 ACRE LOT THAT HAS BEEN PROMISED TO THE CITY OF VANCOUVER AS PARK SINCE1999. THE PARK SITE IS LOT 9, AND IS THE SUBJECT OF AN ASSESSMENT APPEAL FILED BY THE FALSE CREEK RESIDENTS ASSOCIATION. THIS 9.06 ACRE WATERFRONT SITE CARRIES AN ASSESSED VALUE OF $400,000. What does $30,800,000 reduction in assessed property value mean? The Business Tax rate is 1.77683% of assessed property value. This means that Concord Pacific has saved $547,263.64 in property taxes and in 2012, the city’s income is over half a million dollars less that it was in 2011. A couple thoughts. 1) How much is Concord actually saving? Because the article says either $15k or $300k, and that’s a big difference. And there’s no evidence given for the second number, it seems to be completely hypothetical. 2) “With a three year lease on a lot intended to be developed in less than a decade, it would seem that sustainability is not its strongest feature.” Can you just retract this line entirely? As far as I can see, growing food on a lot that would otherwise sit empty is perfectly in line with principles of sustainability. 3) The plot of land in question is, as I understand it, seriously contaminated with cadmium and lead in the soil. This is why it has remained empty for so long (not capitalist greed), and why it still remains unbuilt. It’s also why any farming operation here must be “temporary”, because if they weren’t container farms the produce would be toxic. All in all, this is a weak piece and a cruel attack on a successful nonprofit. i think you mean a successful FOR PROFIT enterprise. SOLE food it not a non profit. god forbid someone should make a PROFIT! Again: “The urban farm could save Concord up to $17,000 in taxes per year” could? Does it or doesn’t it? You’re alleging a property tax break, but does it exist or not? You’d do well to understand the difference between tax avoidance and tax evasion. The former is not illegal. On top of that, the reason these tax incentives even exist is to encourage the use of land for exactly the purposes. The point? You missed it. Completely. The site near False Creek can be easily moved, which is in part the whole point of that operation. The other sites around the city that have been turned into gardens while they developer sits on it hoping to save on taxes however are more permanent installations. This will be a very interesting situation when they try and remove them because the lot is finally being developed. A lot of people get attached to green spaces. This is a complicated topic that deserves coverage. Vulliamy gets full marks for even attempting to wade into this swamp of obfuscation. Some time back the Georgia Straight pointed out this little sweet-deal maneuver. Why should an otherwise empty and unused piece of land garner such return to a developer who is just sitting? Ideal coverage of the situation would be a City of Vancouver staff report with a full listing of tax-reduced properties, with the land taxation calculated for both ordinary development holding purposes and for urban agriculture use with discount. Exactly to what extent are Vancouver residents subsidizing those developers [another such accounting for STIR would also be worthwhile]. Why do we not have that ideal coverage? Probably for the same reason we still do not see an accounting for existing zoned capacity within the City of Vancouver. Power and vested interests deal in opacity while harvesting huge public benefits – and the real accounting remains for their privatized eyes only. The attack is not on Solefood it is on Concord Pacific. What value does the city and the residents of the area put on the 13 years of lost opportunity on the 9 acre park that is owed to the city. Its fairly obvious Concord is waiting for city hall and the sheep council to convince the city to take the viaducts down so they can add a few more buildings. I hate Concord Pacific. There product is bland, uninspired garbage that has turned our downtown core into a wall of leaking glass boxes and they have too much influence with City Council.